See Collapsible Sidebar in Action! This WordPress theme doesn’t need screenshots, since it’s the very theme you see on this site! It’s an extremely amateur effort (especially in the sense of the principles of UI design) but I am putting it out into the world anyway, in the unlikely case that someone might find it interesting. If you are interested in keeping up to date with this theme subscribe to this blog, or follow us on Twitter, or Facebook. You can also click on the Bug Tracker link to file bugs or feature requests against this theme. 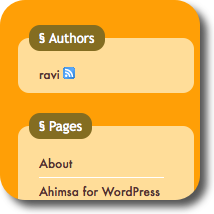 Ahimsa supports skins — CSS stylesheets that can be created and modified using the Ahimsa Options page of the Admin section of your blog. Skins can be used to customise the colour scheme of the theme to your liking. You can even share your skin with other users. Upload the skin file (it can be found in the directory skins under the theme directory) to a site of your liking (I recommend Dropbox) and send me a link, or contact me via email and I can host the file for you. I will then provide download links in this page for each of these skins. If you plan to use such a user contributed skin, please note that I do not provide any sort of assurance on their contents, nor can I support them (sorry). If a skin doesn’t go far enough for you, and you are a CSS ninja who wants more control and detail, all you need to do is create a file called custom.css in the theme directory, in which you can add any styles you desire. And when you upgrade Ahimsa, this file is left alone, so your customisations are safe. This theme is released under the latest version of the GPL (currently v3), whichever that may be at the time of your use. For the GPL, see: http://www.gnu.org/licenses/gpl.html.You are free to use this theme for any purpose you choose, in a manner that conforms to the GPL. I would like you to leave the attribution at the bottom of the theme, but you are not required to do so. Visit the WordPress site for detailed and authoritative instructions on installing themes. For the impatient: it is usually as simple as extracting the archive and copying the directory (“ahimsa”) into your WordPress installation directory under wp-contents/themes. The theme is intended to be bold yet pleasing. YMMV! ;-) It was built, like many other themes, by hacking the default. A cursory look at the contents will demonstrate the rather shallow understanding of the CSS and PHP involved. I hope to clean up most of that in future releases, if there is interest in this theme. The theme uses rounded-borders using Mozilla/Gecko and WebKit/KHTML/Safari/Chrome specific CSS attributes. I could use the CSS3 border-radius attribute, and I probably will, but it won’t help much since IE does not support it anyway. Ahimsa can be taken to mean “non-violence”. If you like this theme, or especially if you decide to use it, please consider rating it at WordPress.org. PLEASE NOTE: these translations are not created or tested by me, but are the work of other Ahimsa users in the spirit of extending free software. I am grateful that they found Ahimsa worth the trouble of translating. Zoe, thank you very much for your comments. I couldn’t agree more on animals needing help. Or at least less hindrance from us! Could you tell me, what kind of plugin do you have for reply button in comment that suitable with your theme? What other plugins can you recommend? Thank you. Hello mobi, I do not use a plugin for the reply button. Are you looking for one with some specific features? Can you elaborate? Also are you asking me for recommendations on any other plugins, or specifically for Reply? Apologies for my confusion. I don’t know about mobi, but one the reasons I love the layout [of the more or less 50-65 total reasons] is because of the reply being obviously accessible. The people I’m [re]doing a blog for, need the simplest and most obvious possible navigation, and this certainly suits this situation. I saw another plugin for a reply, but yours is quite sophisticated and very cool. They keep asking me to simplify the blog I’d put up [basic WP layout, a couple of simple plugins], then took off the menu [at their request to take the blog down, I knew they’d change their minds]and now they want it up again. I looked at both the theme code and your code and can see you have it very personalised so that the ‘Leave a Reply’ box appears under the related comment/reply, whereas, for instance, the ‘Comment Toolbar’ plugin moves [anchors] you to the normal “leave a Reply’. Yours is FAR Superior. I may be able to actualize it if it’s possible for you to tell me what the inclusions are in the ‘href=’ of the ‘postmetadata replybuttonbox’ div. If that’s not possible, could you recommend any plugin that does about the same thing? If you can’t, I’ll use the ‘Comment Toolbar’and play around with it on my own test site. Thanks for all your Great work and kind generosity. Chameleon, apologies this one slipped my notice. Are you still looking for help? Sorry. Thanks Ravi for responding, but I must have fixed it, because I don’t even know now what the problem was that I was talking about then. Following whatever it is I’d done to fix it..I’d then become obsessed with skinning the layout in various combinations. Thanks for this whole wonderful theme, but most of all for the acceptance and incorporation of ‘ahisma’ into the top of the list in my mental dictionary of “First Thoughts To Use on Any Occasion”. Without you being there I wouldn’t have this effective minute by minute reminder. Chameleon, glad to hear it is resolved. And I am happy to have had a small part in adding the idea of “ahimsa” to your thoughts. basic colours, low graphics, minimal distractions, with rounded corners in Firefox, Opera, Safari, Chrome. Very nice job, Ravi, but I don’t see rounded corners in Opera 10 (Linux/Ubuntu). Sorry about the Opera claim. I removed it in Ahimsa 2.2. Opera unfortunately does not support any version of border-radius, even in the latest version. (see: http://wordpress.org/extend/themes/ahimsa) to reflect this. Thanks for your reply, Ravi. I love your stylish interpretation of WordPress. I’m taking yours as a starting point to set up my own weblog (Dutch/Spanish, under construction since yesterday). See my website. Hmm… Matt lives in the Philipines? ;-) (that’s the IP address block the comment came from). I will take the compliment either way. Thanks Matt! And its April 2 already in the Philipines! thanks for this. it has helped me alot. I love the theme and am trying it out for my new website. 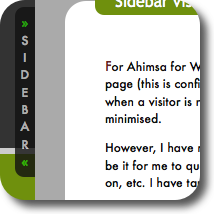 However, I really want a 3 column site and see that your site using Ahimsa looks like a 3 column version. Is it possible to add that flexibility? Or do you have that coming? If so, I’d REALLY love to have it. Kieran, no my site is two-column, not three. And I am afraid no 3-column in the near future. I will investigate it around version 3.0 timeframe (at least 4-5 months from now). In reference to the 3 column theme post. I would not be interested in 3 columns but and I think I am right here why not move the sidebar to the right column or at least give an option to do that. My reasoning on this thought is I believe that search engine spiders start reading a page on the left and if you are blogging with this theme you want those spiders to find your posts easy. Moving beyond that the theme rocks and the colors offer the user a little eye candy and the load time is actually very fast as the eye candy is done by code and not images. Keep up the good work on this great theme! Dustdevil, apologies for the late response. I see your reasoning and I had actually hoped to get multiple sidebar support in this release — the changes are well known at this point — but I just didn’t have the time. They will be out in a month or so. Regarding just moving the sidebar to the right: it’s not a totally trivial change since the sidebar tab has to be moved and styled as well, and that’s a bit tricky. There is an issue/bug filed for this (http://github.com/ahrencode/Ahimsa-for-WP/issues#issue/18) and I would appreciate any comments/thoughts. You can use this bug to track the status as well. Wow, Ahren, I feel in love with Ahimsa at first sight! Fresh, spacious, original — many thanks for sharing. Hi Ahren – I think this is an excellent theme. In the past the themes I have used have been very minimalist and generally I do not like the heavily designed themes, but this is the first design I really like. I love the fact that it is flexible and loads very fast with good CSS. Nik, Patrick, belated but sincere: thank you for your comments. I saw your templates..look great! I wonder if it possible to edit the top header by putting my own logo in it? and how? Thanks. Imran, Nik, Patrick, thank you for your comments. JYO, you will have to go to your Admin section and choose Appearance -> Theme Editor to edit “header.php” and add the HTML code to insert your logo image. If you need further help, please contact me (http://ahren.org/code/contact). I went searching for a new theme and I Love this one! It’s simple and doesnt distract from the content, while being nice to look at. I’m going to tweak it a bit to match my style, but overall nice look. David in case I hadn’t already done so (or even then ;-)) Thank you for the comment. Robert, I think this may be fixed now — the above link works. Can you let me know? Thank you. (apologies for delayed response). The tempalate is great! I use it on my blog,now. Is there anyway that I can show the pages? 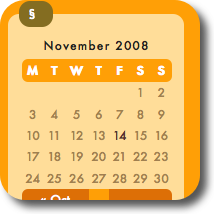 Rudra, you can use the widget system to add a Pages widget to your sidebar. Is that what you are looking for? Thank you for the comments. Hi there, I found this theme on the wordpress theme site, and was very impressed, and I’ve decided to use it for my blog. I’m also considering using it as the home page for my website as well, so I’ve got a consistent theme, and because I like it so much. Axman, thank you for taking the trouble to leave a note. Such comments are a great motivator. How/where do I control the first character? You can either remove it or modify it to your preference. How can I change the font size? I mean, the size of the posts characters, the main font, you know… I´ve been trying a lot but I can´t. Sorry and thanks for all. Hi there, I also use the template for my blog for learners of the German language. Today I installed a phpBB-Forum and now there is the big question on how to implement the forum into the layout – or rather the other way around. If anybody else solved the problem (I know how to do it, but it is soooo much work) – let me know! Thanks for your work, the design is great and really something different! Annik, do you mean that you want to Ahimsa styling for phpBB? Sorry for my confusion and also for the late response. One sidebar its a good option for me. But I have to manage 10 and more pages. So do u plane to add drop menu at the top of your theme? If this happens I could use space of the side bar to put useful widgets. Hello, unfortunately I do not have plans for a top menu. But perhaps you can find a plugin that provides that feature? Thank you for your comment. Thank you! I greatly appreciate your taking the time to write this encouraging note. Nice theme. I am testing it for a new project and love the simplicity but stonrg impact. You did a great job. Anyway I can get the corners rounded in IE? Any simple fix for that?? I would like to thank you for this beautiful theme. I’m working with it right now (http://leetunderground.patricklucas.com/blog) and it is a pleasure to do so. The code is clear, effective, and modern, leaving plenty of room for modification and customization. The default is, to say the least, clean and usable. It has been some time since I have been truly impressed, nay, floored, by a WordPress theme, but yours is deserving. Thank you, and keep up the good work! Hello Winslow, thank you for the kind note (and apologies for the late response). May I drag your attention to the fact that the site once hosting the German translation, http://www.kickasslog.com/, is now held by a domain squatter? Robert, I removed the link to that site after I saw your comment. Thank you for pointing that out. I love the colors etc, but what about a search results page with the list and just a few lines for each article instead of the whole article? It’s OK!!! I just borrowed a search.php file from my other theme (Limauorange) – seems to be working. Thanks Ravi, for a very impressive theme. I think rounded boxes look very professional. I have installed this on a test site, but would like to several mods. I can’t seem to figure out how to do them. Place my own logo in upper part of rounded box extending all the way across. 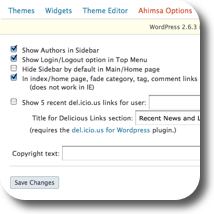 * You can turn off the collapsible sidebar using the Ahimsa Options in your dashboard. By “site and comment feeds” do you mean the links in the black semi-transparent bar at the top? Thanks Ravi for your wonderful theme! change to custom.css that will over-ride any setting in style.css. Sorry for my stupid question. Michele, I am glad its working. It wasn't a stupid question at all. Mikele, please note that you should save your custom.css before you upgrade the theme, since WP deletes the entire theme directory during the upgrade. done using custom.css. Please contact me via email. Thank you. Hi, Good Theme you created! and I will update my progress there. 1. In each page there’s a box for the “Comments & RSS”, I think its place is wrong, and ’cause the lines to be messed up, it should be below the page or to have a feature to be able to hide it. match my style, (2) what happens when a user has lots of pages? thinking of what might be possible here. Im using your theme on one of my sites, and it is very good. I have just upgraded my wordpress to the latest version, and the sidebar has gone smaller, and wraps the links, instead of being fluid and being the correct size. Do you know what is causing this? And if there is a solution? I am having the same issue with this site: http://cafechulo.com – hope to get a reply from you about this. Thanks! I meant http://chulochallenge.com above – thank you! Angela, I am afraid I don’t see the problem. Here’s how your site looks in Chrome at my end: http://cl.ly/7fb72998d462b26e3bdb. Can you explain a bit? Thank you.